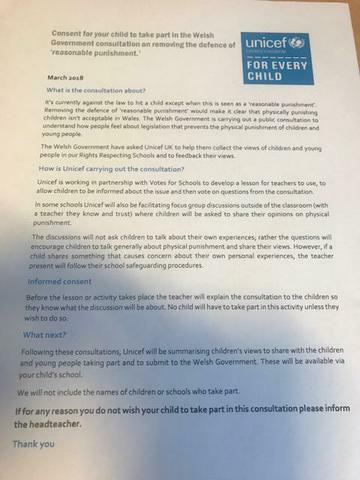 As a Rights Respecting School, Welsh Government wants to hear from our children and young people about their plans to change the law on physical punishment. At the moment, "reasonable" punishment can include smacking, the WG is considering ending this and the use of physical punishment in Wales. We are working with UNICEF to share our views (KS4 pupils) on this important issue, pupils will bring home letters to explain and of course, parents or carers can say they don't wish their child to join in the activity. No names or school names are collected or used at any time. Pupils will have a short lesson on the issue and then have a group discussion about the issue in general, not about personal experiences. No pupils have to take part if they don't wish to. The information goes back to WG via the Rights Respecting Team. Please contact Mrs Morris or Mrs Cox-Wall if you have any questions.